"I hope your many years together gives you memories to draw..."
"So sorry for your loss.May all your memories keep him oil..."
"So very sorry for your loss. Very fond memories of Mr...."
Gordon Ronald ”Pat” Young of Vancouver, Washington, died peacefully surrounded by family on March 29, 2019 at the age of 94. Gordon is survived by his wife of fifty years, Caroline ”Cam” Young; daughter, Alysse Spengler (Ric); sons, Paul (Martha), Tim (Toni) and Scott (Andrea). Gordon was proud of his children and would always include Hendrik Luths, a German exchange student as ’his German son’. Grandchildren include Lara Spengler, Annie Spengler, Evan Young, Rev. Matthew (Kassy) Young, Brooke Young, Skylar Young and Alec Young. He was preceded in death by his father, Ronald Young; mother, Alma Larson Young; brother, Ross; sisters, Joyce (Harlan) Knudson and Janet (Jim) Wiley; and his first wife, Nelda Giblin. Gordon was born in Seattle, Washington and raised in Poulsbo, Washington. 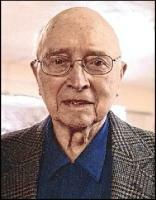 He graduated from North Kitsap High School in 1942. Gordon joined the U.S. Army in 1944, assigned to the 414th Ordinance Evacuation Co., spending time in France, Germany and Belgium. He attended the University of Washington, Olympia Junior College and Western Washington College of Education, receiving his MA degree. He then started his 31-year teaching career with a 24-year tenure in the Evergreen School District (Vancouver, Washington) after teaching in Issaquah, Washington and Centralia, Washington. In the Evergreen School District, Gordon served as a principal at Sifton, Ellsworth, Marion, Burton and Orchards schools, district Director of Finance and retired as Director of Elementary Education in 1984. Upon retirement, he and Cam spent more time with their children and grandchildren, they traveled the world, they enjoyed golfing together and with their sons and son-in-law and he worked in his woodshop. The many special family gatherings and celebrations were marked by Gordon always telling his family how proud he was of them. A devoted husband, father and grandfather, Gordon’s life was one of faith, believing in the saving grace of Christ Jesus. He attended Immanuel Lutheran Church for 58 years. An avid golfer, Gordon was a member of Orchard Hills Country Club for 35 years. While retired he built two wooden boats styled after his father’s construction of what is now known as the Poulsbo Boat. These two boats are part of the permanent collection at the Foss Maritime Museum in Tacoma, Washington. Gordon spent countless hours in his workshop producing all kinds of furniture for family and projects for friends. No project was too small or too large, simple or complex. All he needed was an idea, some wood, his tools and maybe some bandages. Gordon was a family man and a man of faith, an educator, world traveler, craftsman and lover of life. He will be deeply missed. His family would like to offer heartfelt thanks to the Memory Care staff at Glenwood Place (Vancouver, Washington) and Kaiser Hospice nurses who cared for Gordon in his last days. Their care and compassion for our husband, father and grandfather was a source of great comfort to his family. The memorial service for Gordon will be held at Immanuel Lutheran Church, 8310 MacArthur Blvd., Vancouver, WA 98664 on Sat., May 4, 2019 at 3:00 p.m. A graveside service will be held at Poulsbo Cemetery, Poulsbo, WA on Sun., May 5, 2019 at 1:00 p.m.All are welcome to attend to celebrate his life. In lieu of flowers, please send memorials to a or Immanuel Lutheran Church.